In November 2004, Sprint became the first wireless carrier to offer the Treo 650, a smartphone that some considered to be the best on the market. The 650 offered some tantalizing features: 320x320 color screen, a 312 MHz processor, built-in keyboard and camera, Bluetooth connectivity, wireless Internet access, and the Palm OS operating system, compatible with thousands of third-party applications. 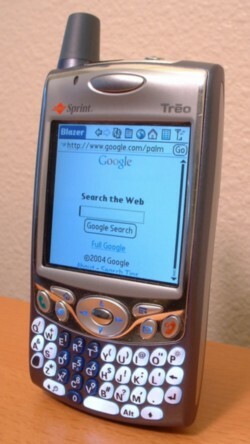 The Sprint Treo 650 was also notable for what it did not include: dial-up networking (DUN) over Bluetooth. This feature can link a computer to the 650's wireless Internet connection, combining the go-anywhere Internet access of a smartphone with the convenience of a personal computer. You could, for example, bring your laptop on a trip and connect it to the Internet just like you would at home, even if your hotel provides no Internet service. And with the help of Bluetooth, you can do all of this wirelessly: Just place the smartphone within range of your laptop and click a button to connect. Unfortunately, Sprint chose to disable DUN-over-Bluetooth on the Treo 650. The company was probably worried that users would take unfair advantage of Vision, their add-on service that gives smartphones unlimited Internet access for a flat monthly fee. The assumption, presumably, is that customers would ditch their existing landline Internet access and rely exclusively on Vision both at home and on the road. The pricing structure for Vision was not designed for this. Although the plausibility of this scenario is a matter of debate (Vision is no faster than dial-up), one thing is clear: At the time, Sprint did not make DUN-over-Bluetooth readily available to its customers. 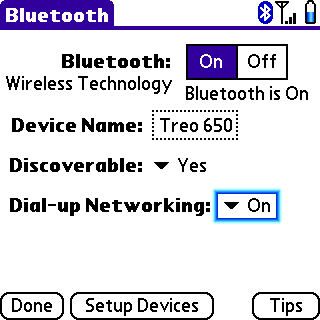 The Treo 650's Bluetooth preferences screen, for example, provided no option whatsoever for dial-up networking. Fortunately, a skilled Treo 650 user (known only as shadowmite) spent several hours tracing code and discovered that Sprint had not removed DUN; they had merely hidden it. A two-byte change in the Treo's Bluetooth management code revealed the hidden setting. With DUN turned on, your Bluetooth-enabled laptop could now get on the Internet anywhere that your 650 could. When Shadowmite posted word of this discovery on the TreoCentral website, the news quickly became a popular thread of discussion. Eventually, however, users began to report problems after enabling DUN: strange system error messages, conflicts with existing Bluetooth devices (such as headsets), fifteen-second powerup delays, and so on. In light of these issues, abuse of the Vision service was evidently not Sprint's only reason to disable DUN. Obviously, it still had a few bugs. In June 2005, Palm announced the Treo 650 Updater 1.12. This new version of the Treo's software fixed a number of bugs, and it also added a notable new feature: dial-up networking over Bluetooth was now officially supported by Sprint. Shadowmite's hack is no longer necessary; the DUN option is available in the Treo's Bluetooth preferences panel by default. All you have to do is turn it on! There is even a special icon that indicates when DUN is enabled. Thanks goes to Sprint for keeping their promises. Today, Bluetooth-over-DUN on the Treo works well, but the configuration process can be a little tricky. This tutorial provides a step-by-step guide on how to connect, complete with pretty pictures. Just follow the instructions below, and you'll be web surfing at the beach in no time. The Treo 680 should also work. See Appendix B, Notes for Treo 680 users. The Cingular Treo 650 works too if you follow the instructions in Appendix D, Notes for Cingular users. The Earthlink Treo 650 has also been reported to work. See Appendix E, Notes for Earthlink users. David Dandy reports that the Sprint 755p works, as well. You don't need the Plus Pack or Ultimate Pack. The standard Access Pack ($15 per month) gives unlimited Bluetooth DUN usage. The latest software updates for your Mac, available by selecting Software Updates from the Apple menu. Danny McPherson reports that DUN will not work if the Bluetooth software on your Mac is less than version 1.5. For the Sprint Treo 650, you will need version 1.12 or higher. You can check the software version on your Treo by going to the Phone application and choosing Phone Info from the Options menu. If you need to upgrade, go to Palm's update page. Some users claim that DUN works fine with no password, but it would not work for me until I could enter my correct Vision username and password when dialing over Bluetooth. Although you can easily find your username (in Treo's phone application, choose Options then Phone Info), the password is a mystery. According to Sprint tech support, the factory-installed password is hidden and cannot be retrieved, not even by Sprint. The changes may take effect in as little as five minutes, although Sprint says it could take up to two hours. Ask them to reset your Vision password and give you a new one. They will read you the new one over the phone. Write it down carefully! Sprint claims that the new password will take effect within two hours. In my experience, it required about twelve. Once you have your new password and have waited for it to take effect, verify that it works before continuing. First, on the Treo, go to the Prefs application, then choose Network. Click Modify and tell the Treo that it is okay for you to change the settings, then click Password. Enter your Vision password. The new password should now be assigned. Click Connect. If you see “Signing on,” followed by “Established,” then everything is working fine. If you see Error 67, then your password doesn't match the Sprint database. You'll need to wait until the new password takes effect, or check that the password you entered is correct. Treo 650 users must skip this step. Treo 700p users, take note! With the Sprint Treo 650, all you needed for Bluetooth DUN was the Vision service added to your normal voice plan. With the Treo 700p, things have changed. Sprint has added special software to the 700p that detects when you're using the Treo to go online with your laptop (as opposed to just surfing on the phone's tiny screen). Sprint calls this kind of access “Phone As Modem,” or PAM, and for some reason they assume that only business users with deep pockets will want it. Therefore, they require you to purchase a special Phone As Modem plan, currently priced at $40 per month in addition to whatever other plan you may already have. That's right: Even if you're paying an extra $25/month for the Power Vision Ultimate Pack, you must still pay another $40/month just to use Bluetooth DUN (no matter how light your usage is). 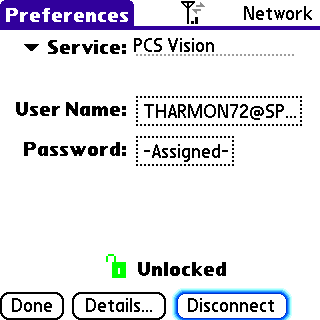 Note that this is the very same feature that comes free (with Vision) on the Treo 650. Backup the data on your Treo in case something goes wrong. Insert a Secure Digital (SD) card into the Treo. 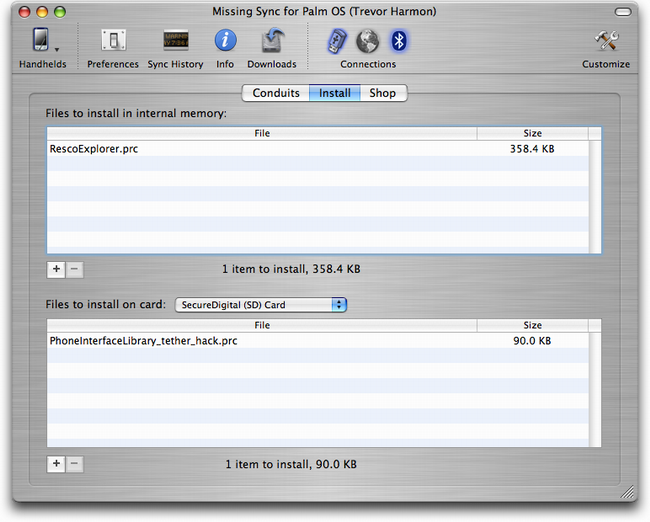 Using a hot sync utility, such as Palm Desktop or The Missing Sync, install Resco Explorer to the Treo and install the hack to the SD card. 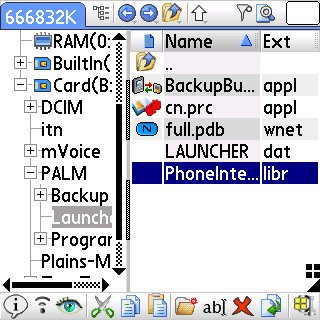 On the Treo, launch Resco Explorer and locate the hack file. It should be in the PALM/Launcher directory of the SD card. 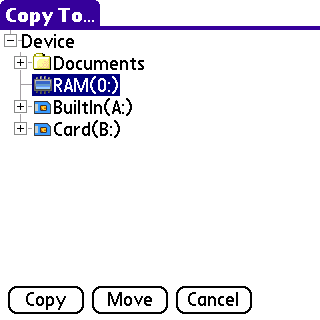 After highlighting the hack file, select Copy To from the Edit menu, then choose RAM as the destination. This will install the hack onto your Treo. Push the reset button on the back of the Treo. 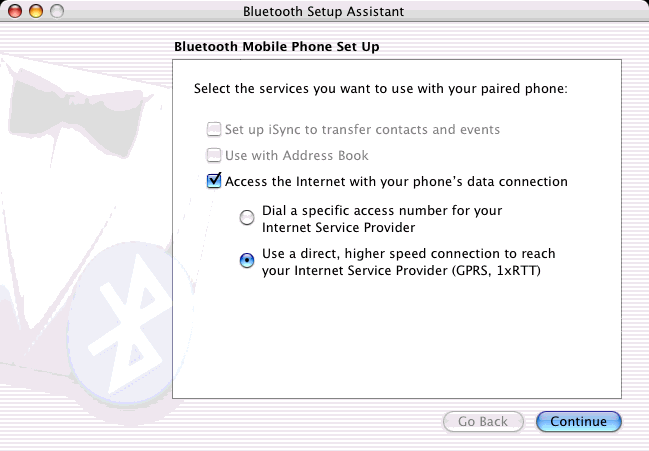 Go to the Prefs application and select Bluetooth, or just click the Bluetooth icon at the top of the Treo's main menu. You should now see the Dial-up Networking option. Turn it on. Your Treo will inform you that enabling DUN will disable Internet access on the Treo itself. It may also cause other conflicts (such as not being able to send files over Bluetooth) until you turn it back off again. First, make sure your Treo is on. Then go to the Bluetooth section of your Mac's System Preferences. Click the Set Up New Device button and choose Mobile Phone. Wait until your Mac finds the Treo, then click Continue. Your Mac will generate an encryption key and attempt to pair with the Treo. 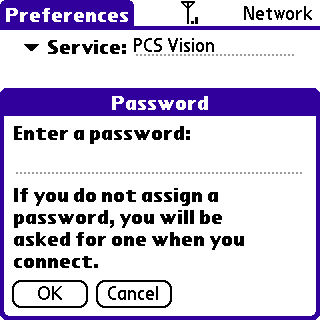 Your Treo should then pop up a dialog box asking you to enter the passkey. Enter the same number that you see on your Mac's screen. 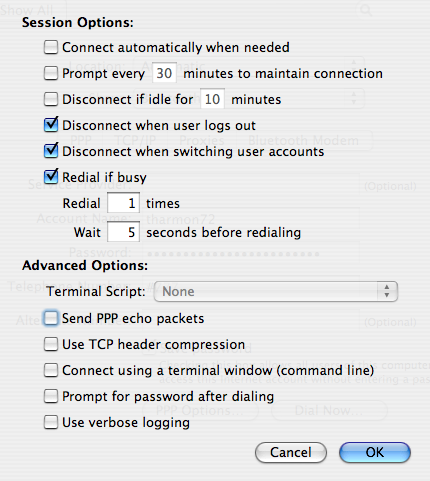 Under Mac OS X 10.4, the options for “Dial a specific access number” and “Use a direct, higher speed connection” may not be visible. As long as the checkbox for “Access the Internet” is there, everything should be fine. Finally, enter your Vision account information. 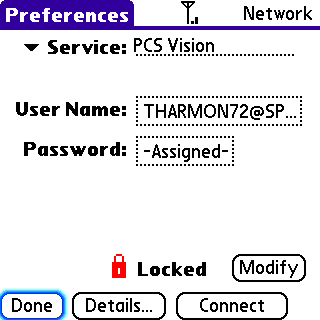 This should be the same username and password specified in the Network preferences of your Treo. For the phone number (also called the “GPRS CID String” on the 650), enter #777. 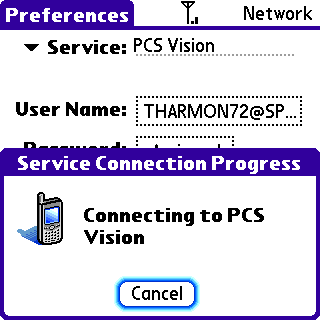 Also, be sure to select “Sprint PCS Vision” as the modem script. If it's not immediately visible, just click the drop-down list box and scroll through until you find it. If you have completed all of the steps above successfully, you are now ready to connect your Mac laptop to the Internet through your Treo, no wires necessary! First, launch Internet Connect on your Mac. Switch to the Bluetooth tab and verify that the settings are correct, then hit Connect. If all goes well, the Internet Connect application should show a connected status like the one below. When you're done with the connection, just hit the Disconnect button in Internet Connect, or choose Disconnect from Internet Connect's menu bar icon. If this happens, and you've been able to connect before, simply resetting the Treo usually fixes the problem. (650 users: Don't forget to re-enable DUN after resetting.) 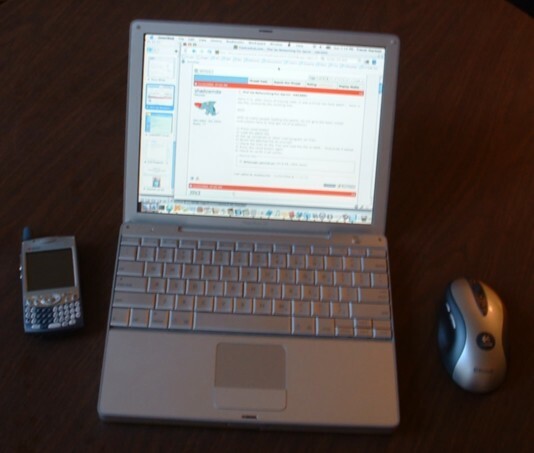 If problems persist, delete and then re-pair the connection between your Mac and the Treo, as described in the section called “Pair your laptop with your Treo”. Less drastic techniques, such as turning off Bluetooth or the phone, then turning it back on again, may also work. Kyle Hart notes that if the phone is off (e.g., after a reset), and you attempt to switch DUN on, you may see an error: “TransLibOpen err 0x740F.” If you first turn the phone on before switching on DUN, you should not get this error. If you get an error saying “There were no supported devices found on your device,” reader Ben Sutherland writes that you should be able to fix this problem by turning off Dial-up Networking on the Treo and do the pairing again. You will still get the error message, but you can then complete the pairing process and turn Dial-up Networking on the Treo back on again. 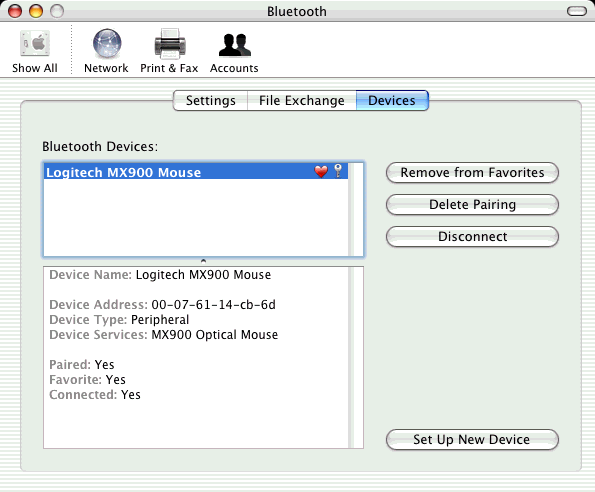 Next, go to System Preferences, choose the Bluetooth pane, select your Treo from the list, and click Configure. You should then be able to turn on the “Access the Internet” option on your Treo. Marc Shomer had been using DUN without any trouble on his MacBook with a Treo 650, but recently his hard drive crashed and he had to reset everything. Now he was getting an error message saying, “Could not open the communication device.” The only problem he noticed was that the “Access the Internet...” option was unavailable when the Bluetooth Setup Assistant asked what services to use with the phone. Luckily, Marc was able to fix the problem in the Devices tab of the Bluetooth preferences. He simply highlighted his phone and hit the Configure button. After repairing the phone, the “Access the Internet...” option was enabled and everything worked after that. Some users recommend turning off VersaMail's Autosync feature. Reader PWC Realtor recommends making sure that Vision is disconnected on the Treo before attempting to enable DUN. If you HotSync over Bluetooth, you may need to disable HotSync before enabling DUN. 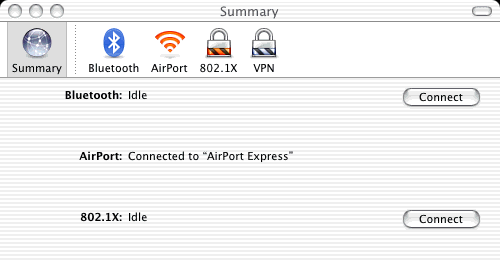 Reader TreoAsh reports that if you have problems reconnecting to the Internet after disconnecting, you can turn Bluetooth off on your Macintosh and then turn it back on again. Reconnecting should then work without a hitch. 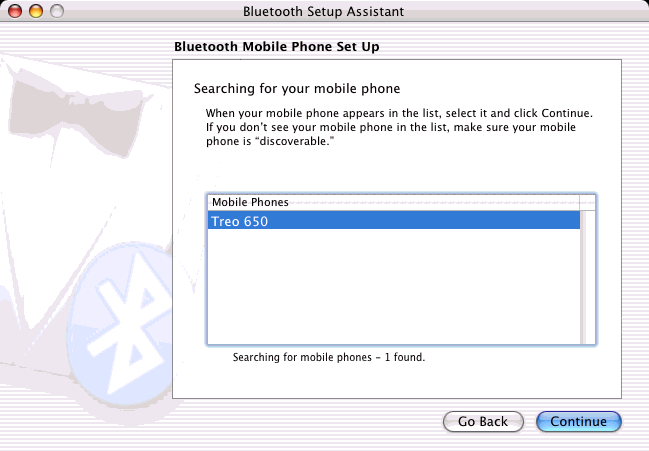 go to the Bluetooth preferences, click the Devices tab, find the phone, and hit the Configure... button. Not sure why, but for me the services were now available and, assuming the scripts are installed and configured properly, everything went swimmingly. and nothing else solves the problem, then restarting both the Treo and the computer (twice each!) might be the only way to get rid of the problem. David reports of a much easier way of handling these RFCOMM errors in his blog. When setting up Internet Connect on the Mac, TreoCentral reader Zeshan Usman reports that in addition to the user name, the Sprint PCS domain name must also be specified. 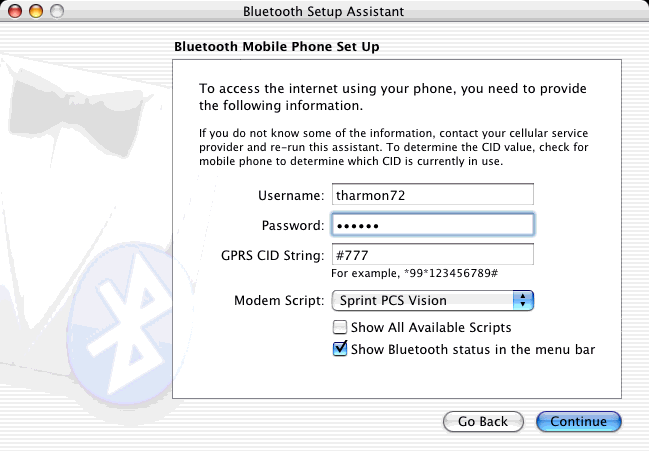 For example, “tharmon72@sprintpcs.com” instead of just “tharmon72.” In my tests, however, this was not necessary. Andrew Ryder wrote in with a suggestion for fixing the “it's dialing but either connecting and not going anywhere or you get a big cycle of those annoying reset messages” issue. Before attempting DUN, he always runs the freeware utility reset netlib by Daniel Grobe Sachs, which resets the Treo's network stack. If he continues to experience connection problems, he disconnects (making sure it disconnected to prevent the Mac from keeping the socket open and requiring a reboot). He then turns off Bluetooth and resets the phone. Finally, he turns Bluetooth back on and redials. If you have any additional tips, please contact me and I will add them to this document. Bluetooth DUN is nice because, once you've got it setup, no cables or third-party software are required. On the other hand, DUN over a USB cable (also known as “tethered mode”) is faster than Bluetooth, and it normally doesn't require an expensive Phone As Modem option added to your monthly bill. However, it does require some special software that you must purchase. Beware that DUN via a USB cable may subject you to usage charges from Sprint. One reader reports that he ended up with $75 of extra charges after tethering despite having an unlimited data plan. Toby Fernsler reports that Bluetooth DUN works great on the Cingular Treo 680. He simply followed the Treo 650 instructions. Charles Brian Quinn has posted instructions on setting up DUN with an AT&T Treo 680. John Blatchford wrote in to report that the Verizon flavor of the Treo 700p should also work with these instructions. There is only one change necessary: When pairing the Verizon Treo with your Mac, choose “Verizon Support (PC 5220)” for the modem script. If you have the Cingular Treo 650 instead of the Sprint Treo 650, the steps described in this document should work if you combine them some slight modifications. Note that I am not a Cingular customer, so I have had to rely on reader reports for these Cingular-specific instructions. The first such report, which I call “Method 1,” came from a Cingular customer who prefers to remain anonymous. The second set of instructions, which I call “Method 2”, is by Prahlad Gupta. The two methods appear to be overlapping, but I provide both because Prahlad's tips go into more detail and provide some troubleshooting tips. First, make sure your Cingular Treo 650's software has been upgraded to 1.15 or higher. The 1.15 version enables Bluetooth DUN without the need for a hack. Make sure that the username and password have all capital letters. You then need a modem script, such as that produced by the GPRS Script Generator from Macron Software. (If you use it, don't forget to register!) The key thing with the modem script (any modem script) is that the Access Point Name, or APN, needs to be set to “wap.cingular” (all lower case). You should then be able to get online with your Cingular Treo 650. Some users have reported that the telephone number “**99***1#” works, as well. Note that the “1” in the telephone number is the context ID, or CID, and may differ between carriers. Getting DUN set up on the Treo. 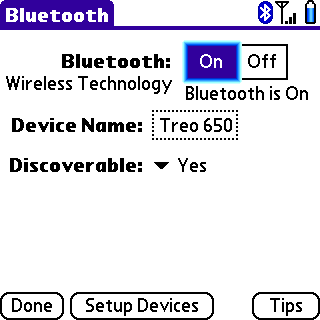 Getting a computer paired with the Treo via Bluetooth with DUN service showing (on the computer) as available from the Treo. Configuring network connection settings so that the laptop can actually connect to Cingular GSM-based internet access, using the Treo as a modem. Make sure Palm's Cingular Treo 650 update 1.15 (or higher) has been installed. If you need to update, go to the update page and follow the instructions to download and install the updater. Installation worked fine for me except that after installation, the Treo went into an infinite loop of starting and resetting. Searching the forums unearthed a tip that led me to do a system reset (not just a soft reset), which put an end to the infinite loop. The Treo has been stable since. But be warned, the forums suggest that people have had trouble with the phone functionality of the Treo after the update. Before doing the pairing, you need to get a Modem Script. This will be needed in Step 3. 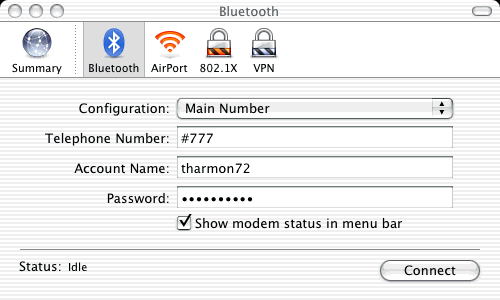 But Mac OS X's Bluetooth Setup Assistant goes straight from Step 2 to Step 3, so have the Modem Script ready. To get a Modem Script for GPRS access, download this software, run it, enter “wap.cingular” in the APN box, click Save Script, and save it as “Cingular (GPRS)”. The software by default saves in “/Library/Modem Scripts/”, which is where the script needs to be. To get a Modem Script for EDGE access, visit Ross Barkman's home page. Be sure to get the “Generic 3G Scripts” toward the lower part of that page. When you have downloaded and uncompressed the file, there will be two scripts: “Generic 3G C1D1” and “Generic 3G C1D2”. Copy or move them to to “/Library/Modem Scripts/”. 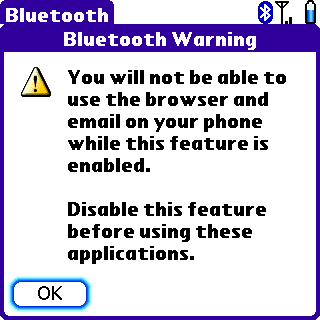 Turn on Bluetooth on the computer and the Treo. On the phone, turn on “discoverable” and “dial-up networking”. Click Set Up Devices, then Trusted Devices, then Add Device. On the computer, open Bluetooth System Preferences. Under settings, turn on “discoverable”. 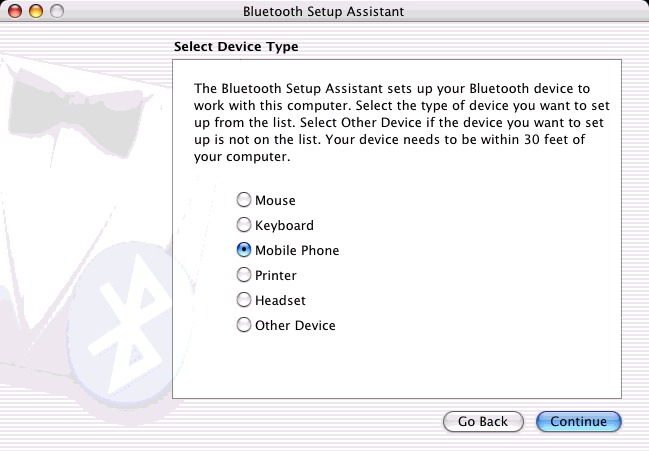 Click the Devices tab, then click Set Up New Device to open Bluetooth Setup Assistant. Choose Mobile Phone as the type of device to set up. Use the Bluetooth set-up assistant on the Mac to do the pairing. At the end of a successful pairing, a screen should come up saying what services are available from the phone. Crucially, this screen should have an option that says something like “Access the Internet with your phone's data connection.” Check this option. (For me, this option didn't show up until restarting the computer twice, and soft resetting the Treo twice). This all worked for me, but I think I also had to turn on “Beam receive” for the Treo, under the Prefs “Power” menu. (I had turned it off, thinking that was a power-saving feature). I think I couldn't get the “Access Internet through mobile phone” option to show up until it somehow occurred to me to turn on “Beam receive” on the phone. But I'm not totally sure that this was necessary. For 1, I set User Name to “WAP@CINGULARGPRS.COM” (all caps). For 2, I set the Password to “CINGULAR1” (all caps). 3 and 4, the Phone Number and Modem Script, are critical and must work with each other. (I suspect that some of the difficulty people have encountered has to do with not matching the modem script with the phone number.) To set up a GPRS connection I used “**99***1#” for the Phone Number and “Cingular (GPRS)” for the Modem Script. To set up an EDGE connection I used “wap.cingular” for the Phone Number and “Generic 3G C1D1” for the Modem Script. 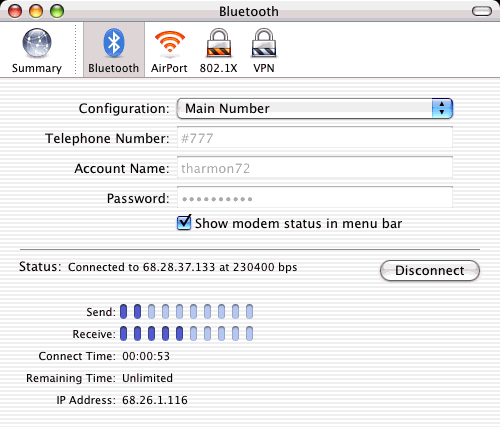 Additionally, the “Send PPP echo packets” option should be turned off in the PPP tab in Network Preferences under “Show USB Bluetooth Modem Adapter”. Also, turn off the “Enable Error Correction” and “Wait for Dial Tone” boxes under “Bluetooth Modem”. Some users have asked for the Windows equivalent of these instructions. I do not use Windows, so I cannot provide instructions for that environment. However, I do know that some software packages provide DUN functionality on Windows for Treo users. One such utility is PDAnet. Dialing this connection should work just fine. 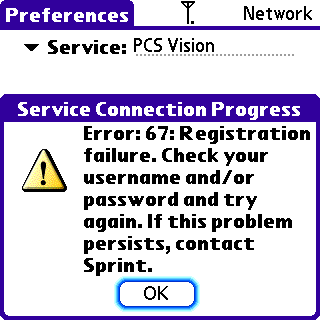 If for some reason you cannot connect, you may need to enter your Sprint Power Vision username and password; however, this is not usually necessary.